A lot of lawyers are extremely challenged about operating in crisis mode and ending many days feeling they were not productive because they were side-tracked into unanticipated interactions, tasks and requests. Being organized and able to prioritize is something some people seem naturally to do better than others, but actually are skills that can be learned and practiced. You can learn good time management habits to determine the difference between urgent and important. Begin with the end in mind. Write a personal vision statement. Before plowing into how to better manage your time and priorities, take a step back and think about your vision and goals for yourself, including your professional and personal life. Where do you want to be in 15 years? Ten years? Five years? What will your practice look like? What management responsibilities will you have? How much time will you devote to your career? Your firm? Your family? Your friends? Your community/causes? Yourself? Write down your goals in a statement for each of these milestone years. Keep these in front of you and refer to them often. Manage your email. If you are like most professionals, you likely spend around three hours a day processing emails. First, set up a folder structure for your email, e.g., each client, one for prospects and business development, one for personal, one for bar or professional associations, one for firm committees or management, one for general firm announcements. Second, be sure to flag any emails you don’t want to receive as spam and ask your assistant to unsubscribe you from any lists you are on. Third, if possible, turn off your email notification for several hours a day and don’t respond to every email when it comes in. If you have alerted your assistant to key emails to help you watch for, she can contact you about these. Fourth, send fewer and clearer emails yourself, only to those who need to receive it, with a clear subject line and clear action request. Remember that for every email you send, you may receive three in return! Meet for 15 minutes at the beginning of every day or end of the day to make a to do list of the meetings, tasks and must dos for that day. Even doing this once a week on a Friday or Monday is a useful discipline. Alert him/her to clients or others that may call or email and flag those for you; let her know what merits an interruption and what doesn’t. Look ahead to meetings where she can be sure the conference room is reserved, refreshments ordered. If meeting with a client or prospect you haven’t seen in a while, ask her to print out a LinkedIn profile of the person and/or take a quick look at the client web site for any company news of importance. Make sure he/she knows how to navigate LinkedIn and reminds you to update your profile; he/she can also send out links to articles you’ve written and remind you to send an invitation to connect to all new contacts, etc. Ask for help with your email review and management (see above.) With enough knowledge of your clients and priorities, he/she can help put emails into folders for you to review by client, management committee, etc. Keep a daily To Do List and prioritize it. At the beginning of every day, write a list of the things you need to get done that day. This will include preparation for meetings, attending meetings, calls with clients, working on client projects with deadlines, business development and management tasks, as well as personal tasks. Place an A or B beside each task to indicate those that must be completed on that day versus those that can carry over to tomorrow. And if there are tasks you absolutely dread on your list, get in 15 or 30 minutes early and do those first thing in your day when you are freshest. Block time in your calendar for longer and important tasks. Begin blocking time into your calendar for chunks of time when you know you’ll have to review or draft documents. Without scheduling this time in, you will inevitably find your days filled with other unscheduled interactions and pushing this work to the evenings or causing a delay in the work-flow chain which then impacts others. Also important is the discipline of discerning urgent tasks from important tasks. Allow as much as 50% for “unplanned” events, crises or interactions. Unless you are in a solo practice, you will inevitably have unscheduled interactions with colleagues in the firm, receive unscheduled phone calls and need to attend to some sudden deadlines. Add a few one hour blocks into your daily schedule to allow time for these unanticipated requests and conversations, especially if you serve in a management role. Concentrate on each task. Learn to close your door, go to a conference room, turn off your email notifier and ask your assistant to hold calls to get work done that you have blocked time out for. Sometimes, this is the work that gets done an hour before the average day begins or in the evenings or on the weekends, since that is when you are less likely to be barraged with emails, phone calls and colleagues stopping by. Track and evaluate how you are spending time. 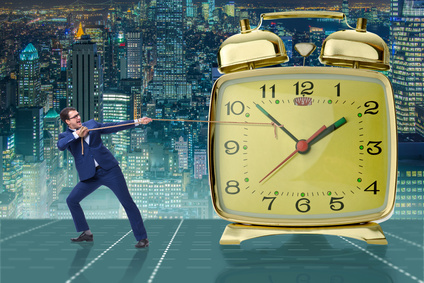 Most law firms still require lawyers to record their billable time, and some are good about providing ample non-billable categories in order to track and in some cases reward time spent on non-billable but important firm activities. Many lawyers don’t record their non-billable time accurately as they don’t believe it is valued and in some cases, believe firm management looks down on them for tracking their non-billable time. It is important for you to be able to evaluate how you are spending your time now in order to improve your time management. Create a daily log and monitor your time for two weeks. You then can take a close look at what is taking more time than it should or than you’d like, where you can delegate, where you can be more focused and efficient, where you can say “no” more often. Be flexible but establish boundaries for work-life balance. It is nearly impossible in today’s 24/7 business world to completely turn off the work clock at a particular hour or for full weekends. Clients and colleagues know you have access to email around the clock and given how competitive it is for law firms to attract and retain clients these days, lawyers feel pressure to be hyper-responsive and always available. You need to be clear on when you will not be available because you choose to turn your attention to family or other personal priorities and activities. Most colleagues and clients will respect this as long as they know you will still get their work done, which might include having others on the team to back you up and share the load. This is in part a question of managing expectations and also finding the right balance for yourself. For example, many lawyers I know with young families might leave the office at 5 but when kids are in bed or doing homework, return to do an hour or two of email follow-up. Learn to say “no.” Look at the occasions where you say no to someone as opportunities to both help you meet your own goals but also for others. In many firms, partners become reliant on and may trust only one or two people to work with a client, take care of a management issue or be assigned an ongoing task or role. When asked to do something that you don’t have time for or isn’t a priority or doesn’t interest you, identify whether there is someone else for whom this could be a good development or leadership opportunity. Learn to be selfish and strategic with your time but not without trying to find a good “back-up” option for the person asking. There obviously are times when you need to be a good “firm citizen,”, partner or colleague and help others out, but often, we don’t have the courage to say no and offer a good alternative which the person asking won’t think to do unless you raise it yourself. Save some time for you! Between client, firm and your family obligations, it is easy to forgo time for yourself. Whether it is a day off, an exercise regime, meditation, time with a friend, participating in a hobby or cause you are passionate about, take time to recharge your batteries.